The cast pushes props and furniture onto the ice like a crystal-like grand piano or a living room set where Crystal’s family mindlessly watches television. The creative minds behind Crystal played with scale and angles to perfect effect. An interactive show, it doesn’t stay away from characters playing with the crowd like Crystal herself conversing with several audience members in the front row, or items thrown into cluster of people to be caught and thrown back. Meanwhile, musical arrangements oscillate from pop culture songs like Sia’s “Chandelier” to classical pieces, all accompanied by the different musicians playing the saxophone, violin, electric guitar, acoustic guitar, clarinet and even an accordion at various periods, some while gliding on the ice. 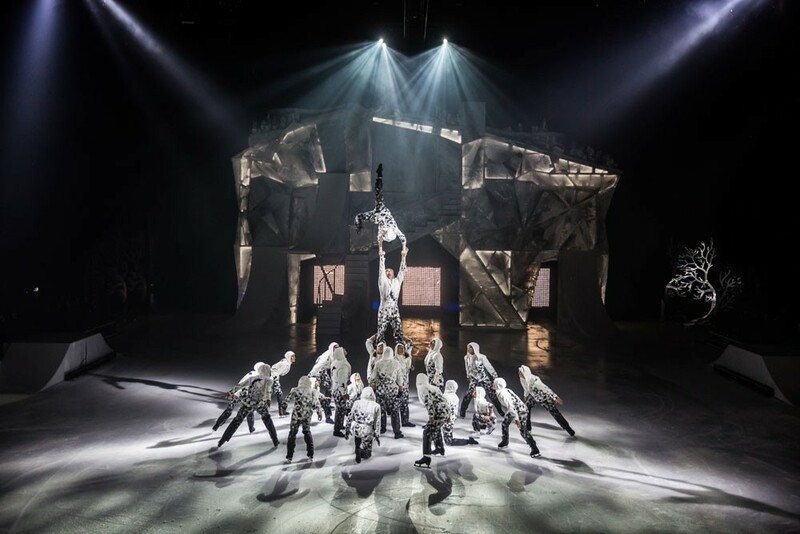 Aerial twists and flips, and characters performing terrifying moves in a seamless manner, like balancing their body on a minuscule stick, are executed perfectly — and not without teamwork. At one point, Crystal and her partner show off their acrobatic talents through a series of harmonious and daring movements. In the end, the entire cast comes on stage to Crystal’s version of U2’s “Beautiful Day” and gifts the viewers one last number. To watch the entirety of this show is to be immersed in an otherworldly dimension where art has no rules and creative boundaries beautifully dissipate.